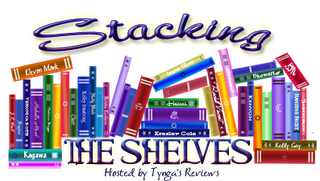 Stacking the Shelves is a weekly meme hosted by Tynga's Reviews to show off all the books we got that week, no matter what format or how we got them (bought, ARCs for review, gifted, won, borrowed...). Since I'm still on my book buying ban (sucky but necessary), I only had one in my mailbox because I had preordered it. I was really happy to get it on release day! :D I'll start reading it over the weekend and I hope I can finish by Sunday night, because then I'll have completed the Sequels Challenge I'm participating in. Plus some origin swag including a signed sticker. I won that during the Origin Olympics that Jessica Khoury hosted shortly before the release. I've reached the first half of my goals, which was to read & review Enshadowed and Black Heart. Click the titles to read my reviews. I've got a good hundred pages left of Rachel Hawkins' Demon Glass, which I hope to read in the next 1.5 hours before I go to bed. That would leave me free to read & finish Scorch tomorrow (I'm writing this Friday night) and Sunday. I had originally planned to read Masquerade by Melissa de la Cruz but I think Scorch will be a quicker read and the challenge ends on Sunday :P So I might complete it even though I started when half the time was gone, had to re-read a big book and started university again. I also finished Ironskin by Tina Connolly, which will be published on Tuesday. I hope to get up my review on Monday. Oh, and in case you haven't noticed: You've got until midnight on Sunday to squeeze in some last entries to my blogoversary giveaway ;) I'll probably pick the winner on Tuesday because I'll be busy on Monday. Good luck! I love your swag! I haven't heard about scotch before, I actually thought it was an orange cover and thought it was pretty nice! Swag is always an awesome thing to have. Great haul of books in your pile this week. I've been eager to read Croak since my cousin told me how much she enjoyed reading it. I love how shiny the covers are for the books in that series. Happy reading! I can't wait to get my copy of Scorch. The author is stopping in my hometown and my mom offered to go to the signing for me since she's not coming out my way. So... now I'm waiting impatiently to get my hands on it. Awesome swag! i need to read this series! Happy Reading! Nice, I'm curious about this book, hope you enjoy it! Happy reading! I really should have a book buying ban but I'd never manage to stick to it. Congrats on the swag and I hope you succeed in your challenge. Awesome! I really want to read scorched, so I can't wait for your review! I'm on a self-imposed book ban, too! :( So I've moved on to buying incredibly unnecessary Halloween themed nail polish! Yeesh! Muahahaha I'm on a book buying ban too..I want to be off it though..WAHHH lol Scorch looks fantastic!